The coconut mealybug, Nipaecoccus nipae (Maskell), is also called the spiked mealybug, nipa mealybug, avocado mealybug, sugarapple mealybug or Kentia mealybug. 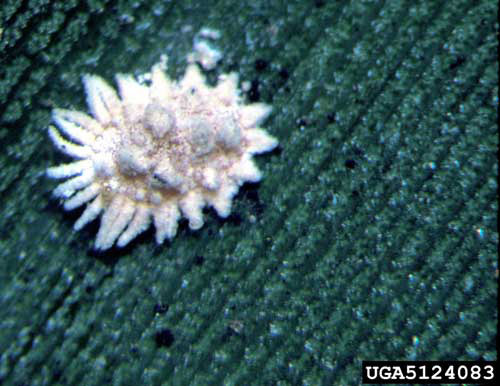 The several names are due to the wide host range of this pest, but coconut mealybug is the most widely used common name. 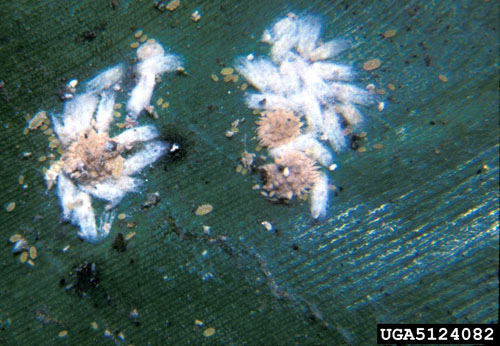 Coconut mealybug may be economically damaging to palms and tropical fruit crops. Figure 1. 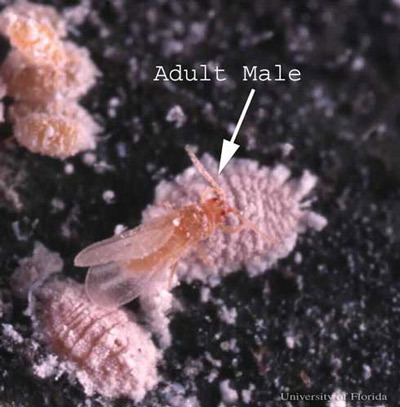 Adults and immatures of the coconut mealybug, Nipaecoccus nipae (Maskell). Photograph by Lyle J. Buss, University of Florida. This mealybug is widely distributed. It has been found in North, Central and South America; Europe, Asia, Oceania and Africa (Miller et. al. 2007). The adult female is generally the best life stage for identification. Final, confirmatory species-level identification of a mealybug is often based on slide-mounted morphological features associated with adult females. Adult females range between 0.059 and 0.98 inches (1.5 and 2.5 mm) long, are oval in shape and reddish-brown to orange in color, covered by a yellowish-orange thick wax and with 10 to 12 pairs of marginal pyramid-shaped wax filaments. The dorsal surface of the body contains five to eight waxy filaments similar to the ones present on the side or lateral areas of the body. No ovisac or egg-containing sac within the female is present. Figure 2. Adult female coconut mealybug, Nipaecoccus nipae (Maskell), feeding on bird-of-paradise. Notice the five to eight dorsal, waxy filaments similar to the ones present on the side or lateral areas of the body. Photograph by Raymond Gill, California Department of Food and Agriculture; www.insectimages.org. Figure 3. Nymphs of the coconut mealybug, Nipaecoccus nipae (Maskell), feeding on bird-of-paradise. Notice the thick yellowish-orange wax. Photograph by Raymond Gill, California Department of Food and Agriculture; www.insectimages.org. Males are oblong and smaller than females. Males develop in very thin white cottony wax cocoons prior to emerging as adults (Hodges et.al. 2008, Miller et. al. 2007). Figure 4. 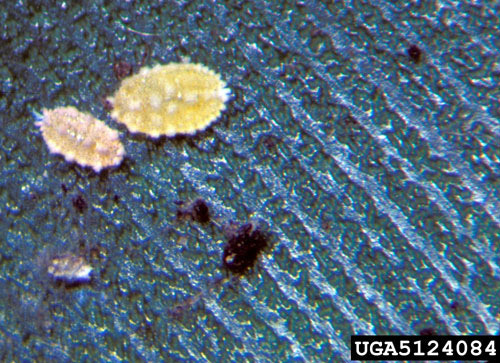 Adult female (center) and male (arrow) of the coconut mealybug, Nipaecoccus nipae (Maskell). Immature coconut mealybugs appear in the upper left. Photograph by Lyle J. Buss, University of Florida. Figure 5. The life cycle of the coconut mealybug, Nipaecoccus nipae (Maskell), is shown in stages appearing on bird-of-paradise. Small first and second instar nymphs are scattered around the image. Larger, reddish-brown, third instar females are seen surrounded by the thin, white cottony wax cocoons of the third instar males. Photograph by Raymond Gill, California Department of Food and Agriculture; www.insectimages.org. (Gilman and Watson 2007, Miller et. al. 2007). Adult females and immatures feed on the sap of the host plant. Honeydew secretions produced during feeding may result in black, sooty mold growth. The presence of sooty mold can result in reduced photosynthesis, defoliation, and occasional death of a young plant (Watson 2004). Ants are often found feeding on mealybug honeydew secretions and may also defend the mealybugs from predators or parasitoids (Ben-Dov 1994, Williams and Granara de Willink 1992). Figure 6. 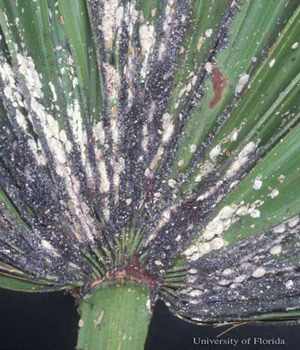 An infestation of the coconut mealybug, Nipaecoccus nipae (Maskell), on a palm species. Black sooty mold growth is common with high populations. Photograph by Lyle J. Buss, University of Florida. Figure 7. Frond yellowing caused by an infestation of the coconut mealybug, Nipaecoccus nipae (Maskell), on pygmy date palm. Photograph by Scot Nelson and Mike Nago, University of Hawaii at Manoa. Figure 8. 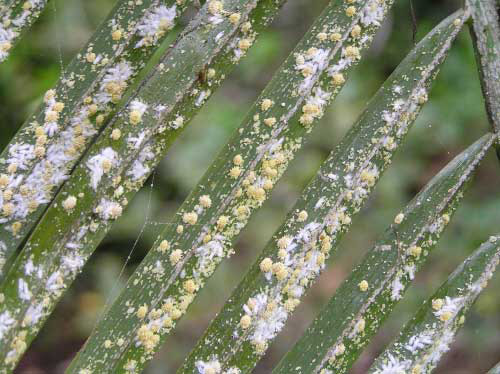 Frond yellowing caused by an infestation of the coconut mealybug, Nipaecoccus nipae (Maskell), on pygmy date palm. Photograph by Scot Nelson and Mike Nago, University of Hawaii at Manoa. Management of scale and mealybug insects begins with detection and identification of the pest. Mealybugs can be very small or resemble disease organisms or even plant structures, making detection difficult. Regular monitoring will allow detection of these pests before damage is obvious and will also allow improved control. All plant parts need to be searched, including the undersides of leaves and stems. Inspection of plants prior to introducing them into the landscape, nursery or collection is very important in reducing new infestations of scales. Management can be difficult because of the waxy material mealybugs produce which provides protection from many insecticides. Pruning or washing infested plant parts can be helpful in reducing populations, particularly in cases of small infestations. A brisk wash spray of water can also be helpful in removing mealybugs from plants and reducing the population. Mealybugs are commonly attacked by predators, parasites and diseases which can help manage populations, particularly for long term control. It is important to recognize the presence of beneficial insects and to take steps to conserve them in the environment so they are available to control the pest insects. The use of Pseudaphycus utilis Timberlake, a parasitic wasp, as a biological control agent successfully controlled coconut mealybug in Hawaii and Puerto Rico (Watson 2004). It is often necessary to manage mealybugs with insecticides so it is important to select appropriate insecticides, timing and application methods to reduce negative impact on the natural enemies but still get maximum control. It is important not to overuse or misuse insecticides which can lead to numerous problems including insecticide resistance. To avoid insecticide resistance it is critical to rotate among insecticide groups. Ben-Dov Y. 1994. A Systematic Catalogue of the Mealybugs of the World (Insecta: Homoptera: Coccoidea: Pseudococcidae and Putoidae) with Data on Geographical Distribution, Host Plants, Biology and Economic Importance. Intercept Limited, Andover, UK. 686 pp. Buss EA, Dale A. (July 2016). Managing Scale Insects on Ornamental Plants. EDIS. (29 June 2017). Gilman EF, Watson DG. (April 2007). 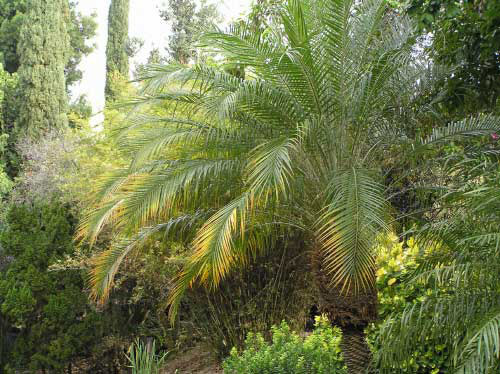 Washington robusta: Washington palm. (29 June 2017). Hodges A, Hodges G, Buss L, Osborne L. (2008). Mealybugs and mealybug look-alikes of the Southeastern United States. North Central IPM Center. (no longer available online). Miller DR, Rung A, Venable GL, Gill RJ. (August 2007). Scale Insects: Identification tools, images, and diagnostic information for species of quarantine significance. Systematic Entomology Laboratory USDA-ARS. (29 June 2017). Rosen D. (July 2005). 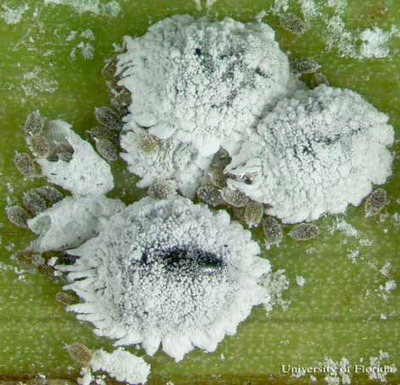 Adult females, nymphs, and waxy egg mass of coconut mealybug, Nipaecoccus nipae. UC IPM Online. (29 June 2017). Watson G. (July 2007). Invasive Insect Report 2004.06. Coconut mealybug Nipaecoccus nipae (Homoptera: Pseudococcidae). University of Guam Cooperative Extension Service Knowledgebase Wiki. Williams DJ., Granara de Willink, MC. 1992. Mealybugs of Central and South America. CAB International, London, England. 635 pp. Publication Date: May 2009. Latest revision: July 2017.